Configure µVision to capture Serial Wire Trace data as described in the manual 32-bit RISC Microprocessor - TMPM330 Family, chapters Port A (PA0-PA7), and Port B (PB0-PB7). Enable Use, select ULINK Pro Cortex Debugger, and click Settings open the Target Driver Setup dialog. Enable SWJ and select SW from the Port drop-down list. 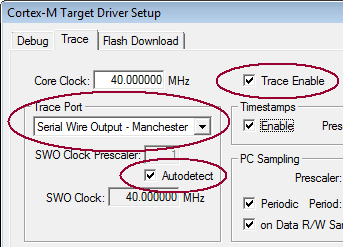 Set the Trace Port to Serial Wire Output - Manchester. Enable Autodetect for the SWO Clock. Make sure the Core Clock is set correctly.